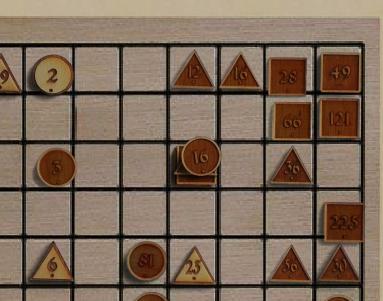 These are the rules at Boardspace - see rules variations for a discussion on the alternatives. Generally, these rules treat all the pieces and movements uniformly, and aim for a fast resolution. The game is for two players, black and white. 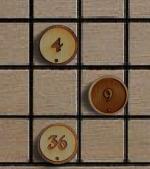 Equipment:: and 8x16 board, 28 black pieces, 29 white pieces with numbers as shown, arranged as shown. 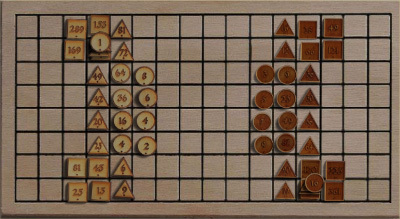 The pieces are either rounds, triangles, or squares, except that each player has one stack of pieces which is called a pyramid. The White pyramid contains 1 and 4 round, 9 and 16 triangle, 25 and 36 square. The Black pyramid contains 1 round, 25 and 36 triangle, 49 and 64 square. capturing pieces whose value sums to 1315 or more White, or 984 or more Black (3/4 of the sum of the total opponent values). 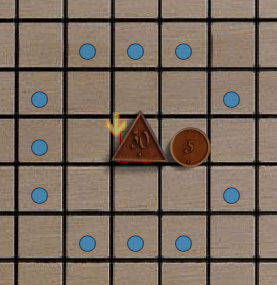 forming a glorious victory on the opponent's side of the board, with one of your own pieces as one end. Movement is only possible to an empty square. Horizontal and vertical moves are blocked by intervening pieces. Moves with a diagonal component can't be blocked - they're like chess knights moves. Pyramids move in any of the ways permitted by any of the pieces they still contain. Capturing depends on the geometric or numeric relationship between the captured and capturing pieces. Capturing never involves moving into the square occupied by the captured piece. Capturing pieces stay where they are. 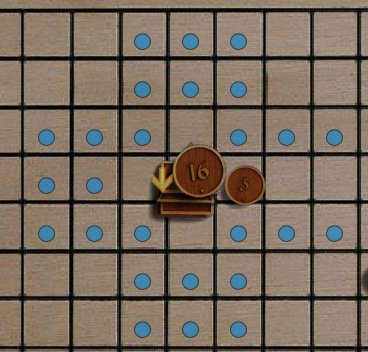 If by luck or design multiple captures are possible after a single move, they all occur. 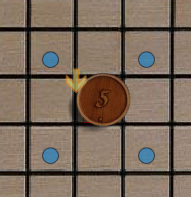 A piece is captured by siege if it is surrounded by enemies or the edge of the board on all 4 orthogonal or all four diagonal directions. 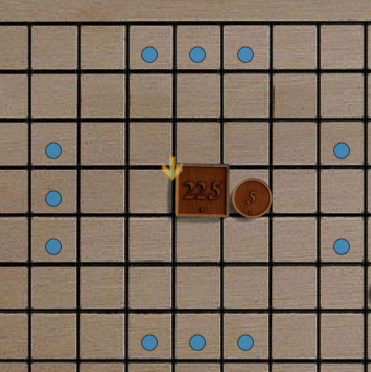 Four whites surround a black piece. A piece or stack is captured by equality if the attacking piece (or stack) has the same value, and if the attacking piece could move to the position of the attacked piece if it were vacant. Note that very few of the black and white pieces have the same value. Black 16 captures white 16 by equality (it can move there by one of its triangles). White 64 captures black 64 by equality. black 64 can't move to white 64's location. A piece or stack is captured by eruption if the value of the smaller, multiplied by the distance between the pieces, is equal to the value of the greater. Captures by eruption do no depend on the natural movement of the pieces. The starting and ending locations are both counted, so the minimum distance between pieces is 2.
depending on whose move it is. 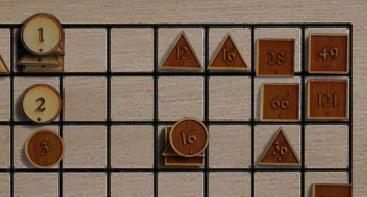 9 or 81 would capture by eruption, depending on whose turn it is. A piece is captured by ambush if two pieces, which could move to the enemy to be captured, have a sum, difference, product, or quotient equal to the captured piece value. they form an unobstructed evenly spaced horizontal or vertical line or a triangle. This page has a table of all solutions.